Greetings friends and fellow crafters. Bear with me please as this is always a hard time of year for me. Not only is it Mothers Day this coming Sunday (14th) but the 12th would have also been my mom's 72nd birthday. 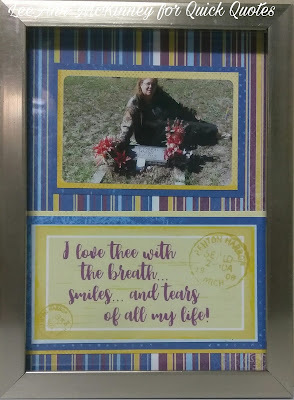 When coming up with a project for this post, I decided to use a photo from my last visit to the cemetery, and if I am able to visit again this weekend it will go with me, along with a card I made last month. For this project, I used papers and a quote from the Mulberry collection, and I was also able to use my wonderful Canon Selphy printer. I really am getting a lot of use out of this little machine. I printed my photo on a 2.5" x 3.5" sticker stock.